★The first Halloween costume for your little space princess! 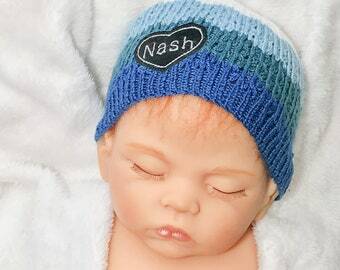 It is fully handmade of very soft acrylic yarn. 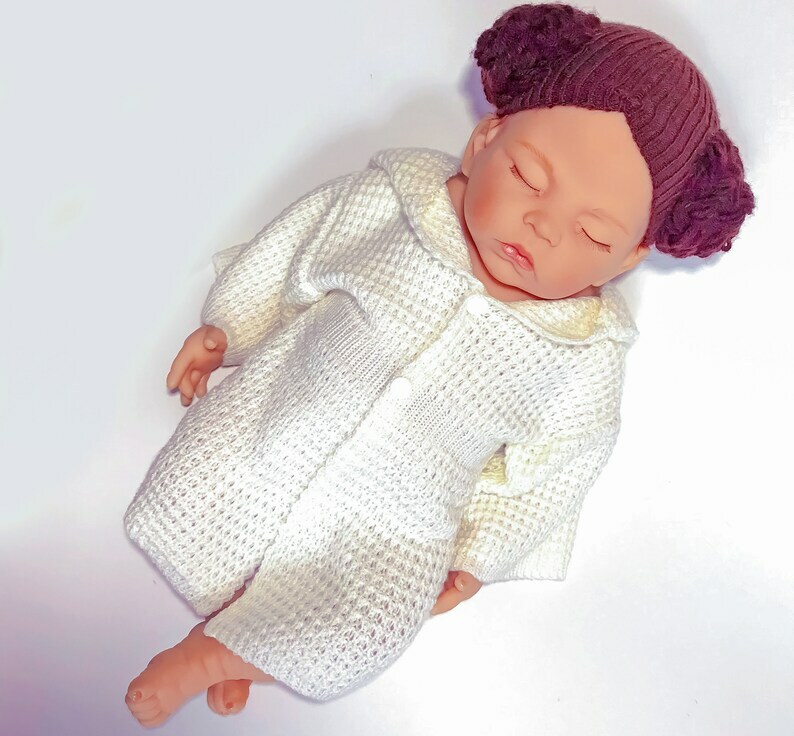 The costume includes a brown knit "wig" hat with braided buns and ivory knit lacy tunic dress with an oversized hood. ★IS IT A GIFT? I will print your gift message on a pretty card. ★MORE INFO in FAQs in the bottom of this page. This was a custom-sized order (12-18 months) for a client's baby who will be that age next Fall/Winter. Made and shipped very fast. 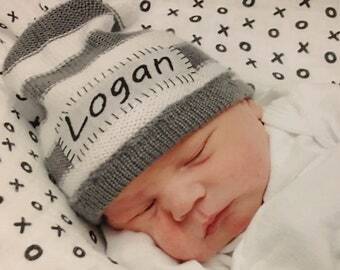 Very cute hat and I'm sure there will be lots of smiles when he wears it! Such a cute outfit! I cannot wait to see it on the baby! I needed an additional hat due to uncertainty of names and all was handled quickly and shipped on time! I accept all major credit cards, Paypal and Etsy Giftcards. Did you know that you can use PayPal even if you don't have a PayPal account? Just fill out your credit card information in a form on PayPal checkout page and use a convenient, secure and reliable service that is recognized all over the world! If you need to cancel your order, send me a message with a cancellation request. Please understand that custom orders can not be canceled if the item is already in the process of making. Orders can not be canceled if purchased item has been made and shipped. In this case you can return you order within 3 business days of delivery and get a refund. I will accept returns within 3 BUSINESS DAYS of delivery date. Please understand, that custom-made items (including custom sizes and colors) items can not be returned and are non-refundable. -Have the item shipped, send me a tracking number for a returned item. -Get refunded as soon as I receive the item(s) back. Please. make sure to choose a correct size. See information provided in FAQs and "Measurements Guide" in item's pictures or see sizes measurements in item's description. 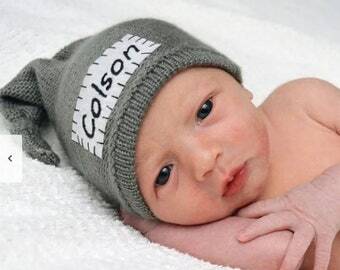 All babies grow different and choosing a correct size is something that only you can do! Standard shipping method I use for US orders is USPS First Class Mail. USPS First Class International mail is used to deliver international orders. Buyers can also choose upgrades to USPS Priority Mail and USPS Priority Mail Express shipping. Import duties, taxes, and charges are not included in the item price or shipping charges. These charges are the buyer 's responsibility. Processing time differs depending on a product. Please, refer to the information om the listing page to see how soon your order will be shipped. All items in my store are handmade to order and completed individually. I don't have items that are ready for shipping on the date of purchase. Thank you for understanding! When packages sent via USPS First Class Mail, in most cases, take 3-5 business days for Domestic and 4-5 weeks for international delivery( orders shipped outside the US might take longer to be delivered due to customs processing times) to arrive to your mailbox, Please, allow 2 weeks for US and 5-6 weeks for international shipment to arrive. ATTENTION: Seller is not responsible for delays in delivery times caused by USPS operation disruptions in connection to natural disasters and other states of emergency. DID NOT RECEIVE YOUR ORDER/PACKAGE LOST? Please, contact your local post office first. 1. Message or email me about the matter. 2. Sign the Buyer Affidavit seller provides, certifying the package, in fact, was not received (for insurance claiming purposes on a lost package). PACKAGE WAS SENT BACK TO SELLER? -PO box, delivered but was not claimed in time. - the item can be sent back/reset to a different address. Buyer is responsible for extra shipping costs. -Please, make sure the address you provide is correct and valid. Items sent to a provided address, that is later found to be incorrect, will not be refunded. -Use tracking number provided to see where your package is. Did it arrive at your PO box? Hurry up to pick it up before it is sent back. Didn't get a tracking number 10 business days after purchase? e-mail or message me about this matter. -Package arrived to your local postal office and hasn't "moved" in a few days? Call the local office and try to have them find it. If package appears to be lost, please, follow the instructions for lost packages. please, do not hesitate to write me a message or an email at gugagiietsy [!at] gmail.com at any time! I am always here to help and listen to all of your concerns and questions. I would love to hear about your experience! And so would other Etsy users. Do you have any suggestions? I want to hear them! You wish something could be done different? I want to know, so I can improve future customer experience! Did you enjoy the service? These news will make my day! Thank you so much for stopping by and taking time to read this! I thank you for understanding, your trust and support of my business! I hope I can make something that you and your family will truly enjoy! Please, see current order processing time in the listing description, and add selected mailing service time to it. Unfortunately, I don't have items that are ready for shipping on the date of purchase. Standard US shipping option is USPS First Class Mail, that takes 3-5 business days. Shipping upgrades are also available at checkout. Standard International First class shipping might take up to 4-6 weeks depending on the customs processing time and local postal office. If you have any problems with the package once it arrives to your country, contact your local postal service first. Can I get it ASAP? I always work hard to complete and ship all orders as soon as possible. If you need it by a specific date, send me a message BEFORE you place your order, and I will do my best to help you! ASAP requests are processed ONLY with Priority Mail and Priority Mail Express shipping options selected. Please understand, that I am not always able to accept rush service request during holidays due to high order volume. Will it fit my baby? 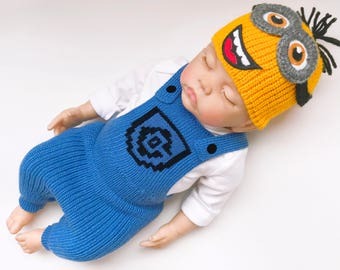 All the sets are made in standard baby sizes from Newborn(0 months) to 12 months. You can see measurements I use for each size in listing description or in the sizing table (if posted in listing images). 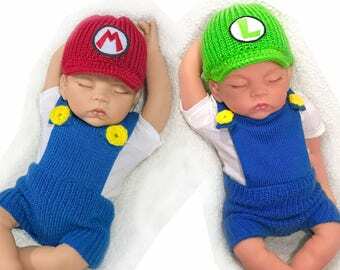 If you cant find a size that would fit your baby ( for example, a hat would fit, but pants are too tight in waist line), select the closest size and write your custom measurements in the "Note to Seller" box at checkout and I will make the set that fits your baby just right! 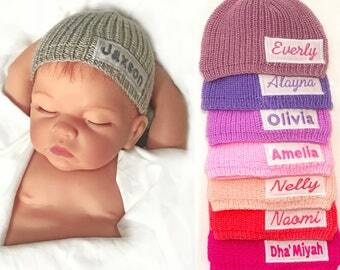 Newborn size - Great if you are going to take pictures of your baby in the first weeks after birth. 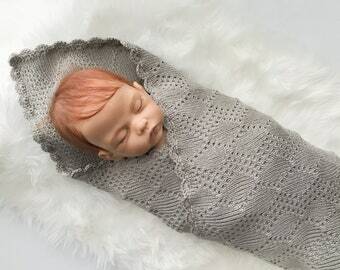 Also will work great for preemie babies. 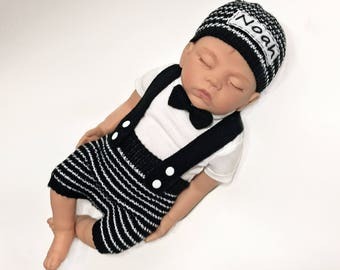 0-3 months - Will work for your baby to wear in the first months and also a preferable size if you are getting it as a gift for the baby to wear at the hospital or soon after birth. 3-6, 6-9, 9-12 - For babies with similar body measurements as described in the sizing chart. 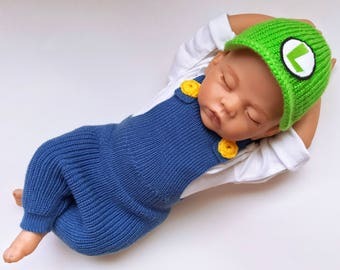 Also, would be a good idea to get it as a baby shower gift. There will be a lot of clothes given in size 0-3 months, way more than a newborn needs. GOOD IDEA: if you don't know what size to get according to the measurements- get a bigger size. Babies grow fast, and clothes can only stretch that much.. If you would like to include a personalized message for your loved ones, please write "Message: " in the "Note to seller" box at checkout and I will have it printed in a pretty card and include to the package! Hand wash only in lukewarm water with hypoallergenic detergent. Dry on a folded towel at room temperature. Please, contact me via Etsy personal messages first if you are requesting a custom size or color. If I can accept your custom size or color request, include it in the "Note to Seller" box at checkout. For items personalized with name, please, write the name in the "Note to Seller" box at checkout. Custom made items can not be returned or exchanged.